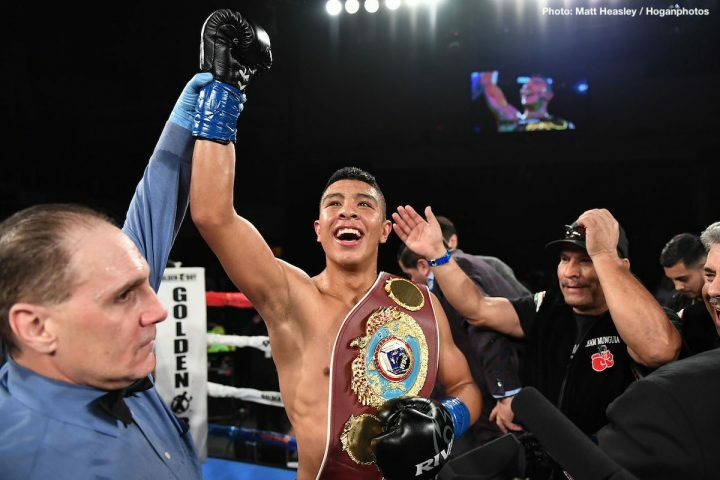 By Sean Jones: Jaime Munguia (29-0, 25 KOs) will reportedly be making his first defense of his WBO junior middleweight title against mandatory challenger Liam ‘Beefy’ Smith (26-1-1, 14 KOs) on July 21 or 28 in a Golden Boy Promotions event in California. Smith is an advanced fighter for the young Munguia to be fighting at this early stage of his career. It would say a lot of Munguia is able to beat a fighter like Smith, because he can take a good punch and he’s smart. Munguia won the WBO 154lb. title in pulling off an upset 4th round knockout win over Sadam ‘World Kid’ Ali (26-2, 14 KOs) on May 12 in Verona, New York. Munguia isn’t wasting any time getting back into the ring after the win over Ali, as he’s only going to have two months to prepare for the 29-year-old Smith. But as you as Munguia is at 21, he probably doesn’t need to rest much after his win over Sadam. Munguia’s management really believes in him to have him fighting just 3 months after his fight against Ali. Smith is going to need a strong chin for him to take the heavy shots from Munguia. The only chance Smith has is to weather the storm in the first half of the fight, and then take him deep to try and stop him. Smith is a smart fighter, and he hits hard enough to knockout anyone in the division if he can connect with enough shots. Munguia’s best chance of beating Smith is to focus on throwing body shots. That was an area that Canelo took advantage of against Smith. Munguia is said to have a one-fight deal with Golden Boy. Munguia vs. Liam Smith will be a good fight for the Mexican knockout artist. Smith is a seasoned vet and former WBO junior middleweight title holder. Smith has wins in the past against Liam Williams, John Thompson, Jimmy Kelly and Jason Welborn. Smith lost his WBO title to Saul Canelo Alvarez by a 9th round knockout in September 2017. Smith gave Canelo problems for the first four rounds with his high volume punch attack. Canelo wasn’t ready for Smith to throw so many punches in the early stages of the fight, and he briefly had problems with the pace of the contest. Smith couldn’t keep up the fast pace and he wound up tiring quickly. Once Smith’s punch output dropped, Canelo took over the fight and sopped him in the 7th, 8th and 9th rounds. The fight was stopped after Canelo knocked Smith down with a body shot in the 9th. If Munguia fights on July 28, his fight with Smith will compete with WBC lightweight champion Mikey Garcia’s unification fight against IBF champion Robert Easter Jr. That’s not a good deal for either card. Most boxing fans will likely tune in to see Mikey’s fight rather than watching Munguia fight Liam Smith, who isn’t well known to the casual boxing fans in the U.S.
Liam Smith will likely give Munguia problems in the first 5 or 6 rounds with his boxing skills, and he decent punching power. Munguia will take over the fight once Smith fades and chop him down shortly after that. Once Smith gets tired, he’ll be at the mercy of Munguia’s heavy hands. Munguia hits harder than Canelo, and he has better stamina. Munguia’s handlers might want to turn into a star in a rapid fashion by having him fight 3 o 4 times a year the way middleweight champion Gennady ‘GGG’ Golovkin’s management did with him. Golovkin has only been fighting in the U.S for six years, and he’s been a star 2015. It only took three years for GGG to start winning over the U.S fan by fighting frequently and knocking everybody out. If Munguia can do the same thing, he might be able to become a star in half the time, if he keeps winning and looking good. Munguia is going to need to take some risks by fighting the other champions like WBC champion Jermell Charlo and IBF/WBA champion Jarrett Hurd. If Munguia beats those fighters, then he’ll have proven that he’s the best fighter in the 154lb division and he’ll be on his way to stardom. Munguia surprised a lot of people in stopping Ali. For one, the boxing fans didn’t know who Munguia was, so they expected him to lose to Ali, who is a clever boxer and 2008 U.S Olympian. Ali moved up from welterweight to fight Miguel Cotto last December, and he didn’t have the size to be inside the ring with a guy the size of Munguia. It was a size mismatch, and Ali didn’t have the wisdom to stay out of range of Munguia’s power shots. It looked like Ali’s management hadn’t properly briefed him on what he had in front of him in Munguia. They should have known Munguia was going to be too big for Sadam.